Circumventing user authorization while making changes to the way a computer system is configured is a feature that makes apps like Trovi Search an unwanted entity. Falling victim to this adware is a matter of installing a third-party program and paying little or no attention to the details of the setup procedure. For instance, some inconspicuous checkmark on one of setup wizard screens can get you infected unless you opt out of the ‘special terms’, which not many users pay attention to. Utilities that are known to be involved in spreading Trovi are Search Protect by Conduit, Yontoo, SearchNewTab, and BookmarkTube. Although seldom, this threat may also be downloaded directly as Trovi Toolbar or Trovi Search, but in that case the user is way off the track in terms of the anticipations for what this app is going to do. Intrusion being committed, the malicious code gets down to reconfiguring the web browsers running on the now compromised computer. Since Trovi is a cross-browser infection, its impact applies to Firefox, Chrome and IE similarly: the homepage and default search engine are subject to an unapproved modification, starting to return trovi.com instead of the values previously set by the victim. From this very moment on, a big portion of the Internet decision-making is taken away from the user. Even if the above-mentioned custom settings are manually altered back to where they were before the hijack, trovi.com will be back the next time the browser gets opened. Is this landing page a threat as such? Not really, unlike the app that causes the redirects. The site is essentially an under-the-table search provider making use of other resources’ keyword lookup algorithms. 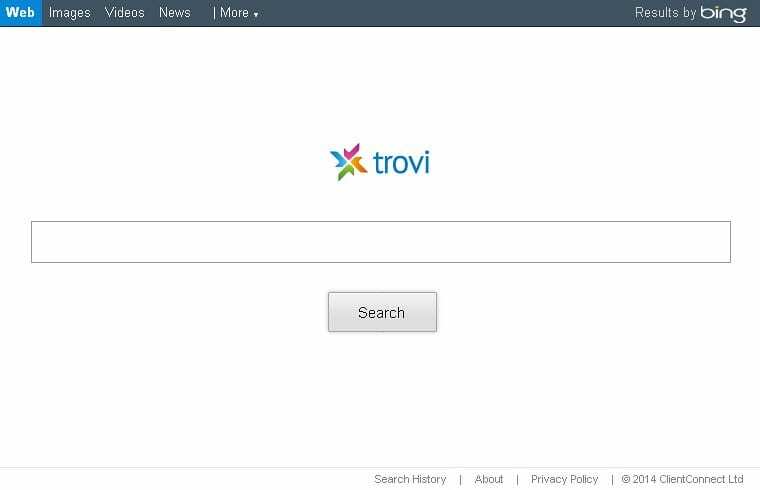 To understand what the point of this entire browser hack is, one should carefully examine the structure of trovi.com and its search results pages – they all either contain big ol’ advertisement banners or sponsored links in a quantity exceeding the limits of common sense. Consequently, the more people visit that page the greater financial gain for the authors of the adware under consideration. Whereas Trovi Search is quite a complex infection sample, the only simple thing about it is the absolute need for removal. Unless cleaned up through strict security effort, this pest will keep on messing up your cyber environment and definitely won’t go away. The fix highlighted here has got proven efficiency in this regard. CCleaner by Piriform is an efficient solution designed to automatically uninstall persistent malware such as the unwanted browser extensions related to Trovi Search hijacker and cease the browser redirect activity. 3. Go to Tools in the navigation menu and select the Startup option. Search entries under all available tabs (‘’Windows‘ through ‘Context Menu‘) for dubious items that might be related to the Trovi adware (Trovi Search, Trovi Toolbar, Search Protect by Conduit, Conduit Search, Yontoo, BookmarkTube, SearchNewTab, etc.) and choose Disable and Delete for each one. If located on the list, these should be uninstalled immediately as they are known to cause trovi.com to show up in one’s web browser without user consent. Scan your system with Bitdefender, the Privacy PC Gold Award winner in Internet security suites category, to make sure all registry entries and junk files added by Trovi Search hijacker have been cleaned up. This step will help you ascertain that no remainders of the infection are still there in case you missed something or if the adware has restored some of its components after manual removal.